Everyone has a particular brand that they see too much of these days. For me, it’s Bath & Body Works – I get at least four emails a week from them, at least one text alert a month, coupons in the mail about once every two months, and their ads may even pop up on my Facebook page. They could just be deeply concerned about the lack of Warm Vanilla Sugar-scented products wafting around my home, car and on my skin, or (more likely) they know that I need them. That’s right – I said it: as annoyed as I am with the amount of ads I get from them, I never unsubscribe. Why? Because when I notice my hand soaps running low or I’m in the shower struggling to squeeze out the last drop of my body wash, I will immediately check my email, collect my coupons and head out to their store knowing that I will save some money. That is what you call effective omnichannel marketing. A recent study by the Winterberry Group perfectly addressed the importance, and struggles, of achieving omnichannel marketing and deploying them in a way that puts the customer at the center of engagement. Direct mail popped up in this study quite a few times – below are three key takeaways that serve as great reasons why businesses should consider increasing their direct mail efforts while the year is still young. When compared to other marketing channels, including mobile, broadcast advertising, owned web content and online display advertising, direct mail was listed as well-suited to support the acquisition of uniquely qualified customers and “in-market” customers (those actively seeking to purchase a product or service). 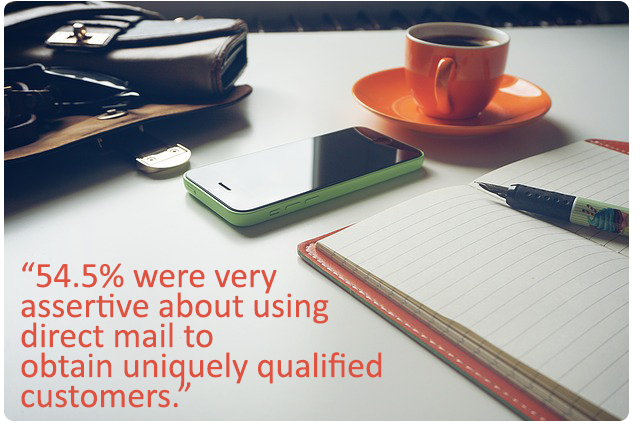 54.5% of panelists, in fact, were very assertive about using direct mail to obtain uniquely qualified customers. In the advent of email and online marketing, traditional forms of advertising were pushed to the side, and it has stayed that way for quite a while. Only now, as marketers shift to an omnichannel approach, is the importance of including traditional marketing being realized. Online web content and advertising may be great for building brand awareness, for example, but alone they are not enough to acquire even a broad range of customers. Email marketing can be one of the easiest and low-cost ways to market to customers and prospects alike. According to the study, 58% of panelists cited email as the channel that best combines with other media channels. Email alone is not enough to acquire customers, however, and it has lost its efficacy throughout the years as people have learned to better filter their inboxes or quickly unsubscribe if they receive too many. To help improve this, another channel must be used, and the most recommended one happens to be direct mail. According to the study, combining direct mail and email marketing is the best formula for acquisition – use email as a first touch, and a direct mail piece as a second touch. This is especially applicable to the increase of augmented reality marketing being done with print, especially Near Field Communication and Video-Enhanced Print capabilities that combine print and digital in new and exciting ways. Using a direct mail piece that incorporates AI can then bring a third channel (mobile) into the group as well, and that will only help you to reach more customers. 23% of marketing experts point to a lack of time and resources as the reason they have not implemented multichannel marketing. Almost the same amount (21%) say that they blame a lack of understanding to even develop multichannel campaigns as another reason. The pressure is on for all businesses to dedicate time and money to not only boosting SEO and online marketing, two of the trendiest marketing channels at the moment, but excelling at it as well. While this may be easier for bigger businesses to do, it’s often hard for small businesses to find the time and resources to do anything more than have a nice-looking, updated website. Direct mail is easier for small businesses to understand, and it’s easier to maintain compared to SEO campaigns. Many small businesses try to get into search engine marketing and may even invest in some nice tools, but if they cannot hire a dedicated person to manage it, or if they quickly become frustrated due to a low ROI after a month or two, they may scrap it altogether. With that being said, it is best to stick to a marketing channel that will be well-maintained over time. Given direct mail’s success with pairing with so many other channels, as well as its ability to acquire specific types of customers that are often similar to what SEO would capture (including “in-market” customers), it is certainly the channel of choice when it comes to easing into omnichannel marketing. Midwest Direct can be your one-stop shop for multichannel marketing, including data cleanup, print and digital services. Contact us today to get started.